Tamarac Movers – If moving were easy then people wouldn’t dread it. At Discount South Florida Movers, we understand this and will work with you to make the move run smoothly. Our professionals have been moving people like you for over 15 years. During that time, we’ve earned a reputation for putting the customer’s mind at ease during the move. No matter what you need done, Discount South Florida Movers can help you. We can securely pack you belongs, ship them long distance, or even provide you with storage. If you have any special requests we can accommodate them, including scheduling a night or weekend move. We guarantee that you will be satisfied with your move and we offer the lowest rates around. Tamarac is a city of 60,000 people incorporated in 1963. The city was designed by Ken Behring and was originally conceived to be an active adult community. As more people moved into the city it morphed into a bedroom community. In order to keep with that theme, the city allowed Fort Lauderdale to annex portions of their commercial zones however they did regain some later on. The city is located on the western edge of Broward County in South Florida. The city is situated on 12 square miles and lies right outside of Fort Lauderdale. Most of the people who live in the city work in the Fort Lauderdale area and commute back and forth. Bedroom communities such as this are perfect for people that want proximity to their work but peacefulness afterwards. 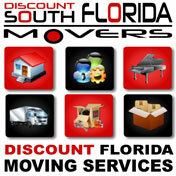 Discount South Florida and Tamarac movers provide low rates on residential, commercial, piano and long distance moving.